Just before the Christmas holidays I tried my hand at making my own sauerkraut. I've never been a huge fan of sauerkraut, but after reading more about the benefits of fermented foods and especially vegetables, I decided to give it a shot. Well now I'm hooked. I love it and try to find a way to eat a little of it every day. As is usually the case, I couldn't believe how incredibly simple it is to make your own sauerkraut. Fermented vegetables like sauerkraut contain lactobacilli that enhance the digestibility of the food and increase the vitamin and mineral content. These beneficial bacteria produce helpful enzymes as well as antibiotic and anti carcinogenic substances. The lactic acid produced in the fermentation process keeps the foods in a state of perfect preservation and promotes the growth of healthy flora throughout the intestine. Shred a head of cabbage very fine and add a tablespoon of salt. Work the cabbage either with a wooden mallet, potato masher, or like I did, with my bare hands, until the cabbage starts to get soft and release some moisture. Pack the shredded cabbage in a glass, quart mason jar and pour any liquid over the top. Pack the cabbage down until the liquid completely covers the cabbage. Put a lid on the jar and store in your pantry for two weeks. I stored mine for two weeks and found the flavor was great. I've read that sauerkraut needs only one week for good flavor or that some even let it ferment 3-4 weeks. Once you open the jar, keep it in the refrigerator and use. It will continue to slowly ferment and add flavor in the refrigerator. This was hard for me as I didn't use sauerkraut regularly before, but my favorite thing to do is to make a lettuce and tomato sandwich and top it with sauerkraut. Yum! I've heard of using it on tacos, with any meat, over salads, and etc. Some like to just eat it plain. Of course there is always corned beef sandwiches...you decide. If you want to make a lot of sauerkraut at once and have a few extra bucks laying around, you might consider purchasing a German crock. Check the link below for some great recommendations! Okay, I love sauerkraut and had no idea it was that easy to make. Can't wait to try it!! The beauty is that this sauerkraut is fresh, raw and full of all kinds of great probiotics and enzymes. Much different than the pasteurized stuff you buy at the store. 3 years later! 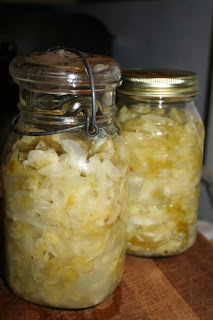 I've been making sauerkraut since just about the time of this blog. My kraut is made with red and white cabbage, himalayan salt, a sliced red onion, 4 minced garlic cloves and a good tablespoon of caraway seeds. If I have any whey left over from my kefir cheese, I throw in about a 1/4 cup. We love it, and eat a bit every day. This is a delicious variation and I can't wait to make some!! Thanks Fredericah!